Do you need a bit of help but don’t know where to start? Then start with me, your village agent, Cath Holloway. My job is to point people in Rimpton and other local villages in the right direction to find the help they need and support them to get in touch. I am employed by the Community Council for Somerset which is a registered charity and company limited by guarantee providing services to people in rural Somerset. 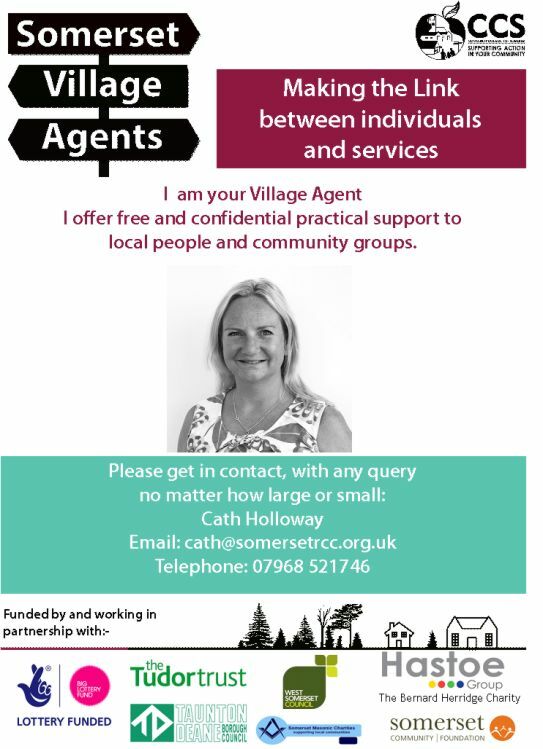 I am a member of a team of 16 Village Agents across the County. I have been asked about a wide range of issues such as fire safety including smoke alarms for people with hearing loss, disability services and benefits, Surviving Winter grants and grants for people affected by flooding, carers support and transport for people unable to use public transport. I am always very willing to find out if I do not have the immediate answer and all my work is done completely confidentially and is free. I attend the village cafe at Marston Magna each month. Alternatively you can contact me by email at cath@somersetrcc.org.uk or by phone on 07968 521746. As I work part time please leave a message and I will get back to you as soon as I can. You can see my latest news items by visiting the Village Agent News page.